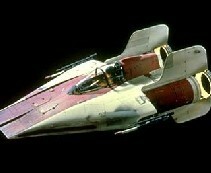 The A-wing, is an interceptor starfighter used by the Rebel Alliance. It is the smallest, fastest and most maneuverable of the Rebel fighters. The A-wing has very limited shielding, and relies on its high linear acceleration and maneuverability to avoid destruction. Its essential build is that of powerful engines, weaponry and little else. The fighter was designed by Alliance General Jan Dodonna and Alliance engineer Walex Blissex, and was produced in various locations, with many fighters having slightly different characteristics. Later, Koensayr Manufacturing, producer of the obsolete Y-Wing, began mass production and this idiosyncrasy disappeared.